Sometimes I forget that not everyone else in the world is concerned with snow the way I am. Like folks everywhere, I get into my own little zone, thinking all my dreams are the most important, all my problems are the most serious, all my thoughts are in tune with everyone else's. That's why I look out my window. From where I write, I can look out across the river and up over a ridge. It helps remind me that there are other things out there in the world. The problem is, every time I look out the window, I see snow. It's not really a problem; actually, it's a boon for us as innkeepers and snow fiends. But people who don't live in the North Country don't get the same sense of snow that we get up here. It's not in their consciousness the way it's in ours. And if they're not thinking about it--if it's not piling up in their back yards and wrecking their drive into work--they're not thinking about skiing, which is what we want them to think about. At least the skiers among them. We've had a lot of snow this winter, and we're happy about that. Stowe Mountain Resort reports that over 300 inches have fallen on Mt. Mansfield so far, and the snowiest month of the year--March--is still two days away. And even though we've had a couple of rain events, it hasn't dampened the quality of the winter. The National trail and the Goat trail on Mt. Mansfield all had boot-deep snow on them yesterday, and I was continually and happily tossed out of my fall line all afternoon. But there's a melancholy aspect to all this snow, this winter season. Snow, like winter--like life--is impermanent. It's anticipated, it arrives in fits and starts, it swells to great importance, then it wanes. Even though we'll probably ski again this year until the middle of April, the snow will soon be gone. We'll do our best to ski through March and get the most of it. 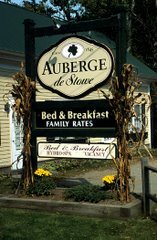 When we first started out as innkeepers, one of the things we wanted to develop was business with groups coming to stay in Stowe. Actually, we just wanted to develop business, any business, preferably the kind of business that paid us money. But we thought, "Hey, let's get a bus load of people in here!" We soon realized that buses seated sixty people, and we could only fit twenty or so in the Auberge. So the group idea went away--for a while. Then, four years ago, we got a call from a fellow innkeeper. His place was a little bigger than ours--he could accommodate a bus load, but only one bus load. And one of his regular groups had grown into a bus and a half. He couldn't fit them all in his place, and he was loathe to forgo the income. So he asked if we'd like to take part of the group. We jumped at the chance. The group turned out to be the Harvard Ski Club, a group of undergrads up for five days of skiing at the end of January. We really weren't prepared for them because when they arrived, they simply took over. There were too many of them. And there were horror stories from our innkeeper friend about parties and damage and all kinds of other unmentionable behaviors. The good news is that they were mostly good kids, and they responded when we laid down the rules--rules like the kitchen is off limits. Chantal would prepare and serve all the food for them, and that was a big hit. They felt like they were at home, like they were being cared for--and they were. Over the years that the Harvard Ski Club has been coming here, we've had all kinds of interesting situations emerge, and most of them revolve around the hot tub. (Again, this is a family show. If you want the details, I'll give them to you beside the fire the next time you stay with us.) Most of the problems have to do with tripping breakers and leaving doors open--apparently door closing is a custom observed only by Vermonters. But once in a while some precocious person wanders into the kitchen, usually to be rebuffed by the dog's bark. The last time they were with us, a few weeks ago, I discovered two couples in the kitchen one night, heads stuck in my fridge. I scurried them out with threats of tetanus shots if the dog caught hold of their thongs. This year was the last time we'll have the Harvard Ski Club. Their semester schedule is changing next year, and it's likely they'll only have about half the number of skiers coming up to Stowe during their break. We'll miss taking care of them, we'll miss the way they make us remember the haze of our own undergraduate days, and we'll miss the money, too. But I think most of all we'll miss the association with the prestigious institution, and the possibility of connecting with young people who will be back to Stowe again and again.